Nov 6, 2012 by Paul O'Connor 2 Comments Posted In: Say What?! 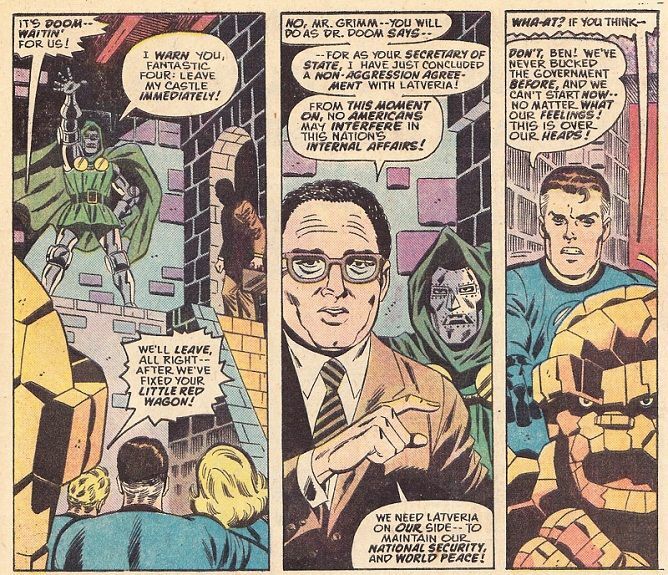 The Fantastic Four have faced more danger than half the Marvel Universe put together. We’re talking mole men, extra-dimensional terrors, and planet-devouring cosmic gods. But nothing could prepare them for… Henry Kissinger! Yep, that happened (and it was far from the silliest thing to occur in the pages of Super-Villain Team-Up). When you think about it, an alliance between the good Doctors Doom and Kissinger makes sense — Henry had plenty of experience working with Dicks! Say What went political! We are doomed. It is election season after all. Zinga!